October has killed for less. will be able to track it down and put it under observation. up of the meeting place is bound to eventually attract attention. do it in Mykonos, probably the most famous Greek island. people are not mentally retarted either. people from around the house, in case they attract attention. reporter hanging around would make a story the next day. the two around, as if it is a London souvenir, also is not plausible. thread of action going on, with mostly predictable turns. this second adventure of his to be replace by Gabriel Allon. 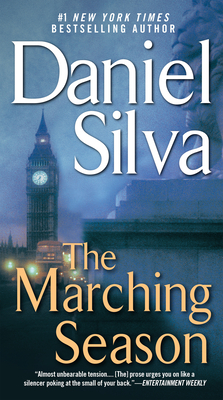 Daniel Silva's books and I remain a great fun of them. Any book by Daniel Silva is worth reading, probably several times. As a great fan, I have re-read all of his books several times, and have had the privilege of hearing the author speak in person. This is an author who combines an in depth knowlege of the history, politics, culture and espionage-history of the Middle East and the West. His books are totally engrossing - you won't be able to put the book down until you come to the supenseful conclusion, however, you also will be educated along the way, in a subtle manner that you will hardly notice. This book, however, does not deal with the Middle East, but rather the "troubles" in Ireland-England relations and the terrorist war that has been occurring since the seventeenth century. Silva has an uncanny knack for sketching charachters that embody a point of view or a philosophy, even if such views are repellant. Such is the charachter of Delarouch - a terrorist with no seeming history, whose life is a brilliant yet horrible accomplishment of violence in it's terrible banality. He has no charachter, except that which is a utlity for terror. Even his appearance is in the service of his crimes, for he is forced to surgically alter his facial features and assume new identities to escape detection. Whatever the mystery of his motivation, he seems to be a man without recognisable empathy. The many strong charachers in this book will stay with you after the story is over.